In the first half of the twentieth century, it was a common practice of many immigrant families and African-American families to purchase life insurance policies on their infant children. Indeed, as late as the 1990's, an otherwise respected baby food company was sponsoring such insurance policies. Why would someone purchase a life insurance policy on an infant? Isn't the textbook purpose of life insurance to provide for the survivors' needs in the event of the insured's premature death? Well, that's one of the purposes. The families who bought these policies [and my family was one] were told that the policies were a way to "build wealth" or to provide a "nest egg" for the young person's adulthood. Sometimes the less-educated or illiterate were simply told that it was a way to "protect" their child. The policies that were sold in this manner were a species of "whole life" insurance (now sometimes called "permanent insurance"), which simply put, require premiums to be paid for the insured's whole life or for some other specified period until the policy's "cash value" is fully paid up. The insurance component remains in effect as long as the premiums are paid (i.e. for one's whole life--in practice usually to age 95, although I understand now in some cases, it can last to age 121!). The cash value is accumulated from a portion of the premium paid. The policy can be surrendered at certain points for the then-accumulated cash value. (This is a simplified description of what today is a somewhat more sophisticated product). In the case of these policies on infants, the premiums were payable at least until age 18 or 21 to receive the maximum death benefit; and could be paid longer for a greater cash accumulation. Whole life and its more recent companion product, universal life insurance, can be good investment vehicles in a well-planned and well-managed portfolio. But the folks buying these products in the first half of the twentieth century rarely had access to financial or estate planning information. And truth be told, they would have been better off in most cases putting their money in the bank. Today, these policies don't turn up often because of the greater access to other investment and saving vehicles. More people can buy stocks and bonds today than ever could be before. These instruments are no longer just for the wealthy. One company that sold the infant policies was the Missouri Life Insurance Company, formed in the 1830's as the first insurance company in St Louis (see Missouri History Recalled During Past Week, The Sikeston Herald, March 13, 1936, p.3, available from Newspaper Archive.com). In 1907, the company was issued a corporate charter by the Missouri Legislature. The company existed as a major business force in St Louis and Missouri for more than eighty years. In 1956, the company changed its name to Life Insurance Company of Missouri (Business Notes, The Sunday News & Tribune [Jefferson City, Mo. ], April 15, 1956, p. 9). But in 1957, it was taken over by Cincinnati-based Western & Southern Life Insurance Company, which remains in business today. These infant policies will eventually become known as a bit of socioeconomic and anthropological ephemera. 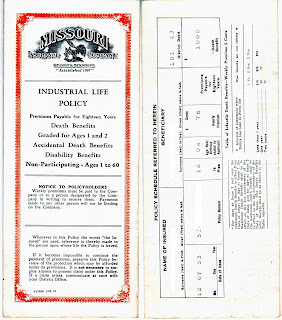 Below is a copy of a policy sold by the Missouri Insurance Company in 1953. In addition to the death benefit, there are "Accidental Death Benefits" and "Dismemberment Benefits." The premium on this policy was $0.76 weekly for maximum death benefit of $1000 if premiums were paid for 18 years. Craig, that is a great artifact. Sorry to be the "Devils Advocate" but thought I would share some thoughts on why these policies were so popular and seemed a good investment then and even now. First, as you point out, the primary purpose of a life insurance policy is provide for the survivors' needs in the event of the insured's premature death. I am a person who has personally witnessed several deaths of infant children and have seen how emotionally devastating it can be. So much, to the point, that the parent(s) in question were not able to work for a period of time due to the grief. State and other disability allotments, then and now do not provide an adequate benefit amount to replace the parents salary. Also, many employers while sympathetic may not hold a job for an individual while they are undergoing their period of grief. I have also seen this first hand. In my own family history, I have many ancestors and relatives past and present who have lost multiple children under the age of l year old to childhood diseases, pneumonia, cancer and other factors. One great-grandmother lost 6 chidren. Thank goodness, medical advances have been made to reduce the number of infant deaths but they do still occur. I know that .76 cents a week does not seem a lot these days but back in earlier times it might have meant the difference in going hungry or not during your grieving period. Some of my relatives have shared that back in the 1940's, some people were only making a dollar a week. Anyway, given the high infant death rate, parents who had already lost an infant(s) or knew others who had, may have thought it was more feasible to pay a 5 cents premimum in the event one of their children died and they were not able to work for a while as a result of it. Just a thought. And a good thought, too. I may have committed the historian's grievous error of looking at an old practice through the cultural lens of today. Thanks for the insights, Karen!